Whether you’re looking for a street a few blocks up the road or half a world away, the iPad’s mapping and navigation apps can find and deliver the information you’re looking for. No more getting lost — in Jersey or Japan! 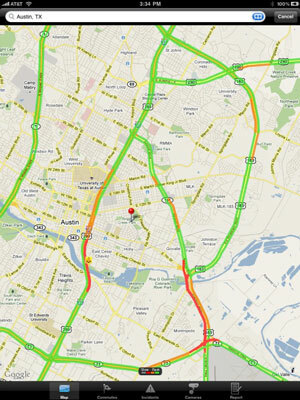 Inrix Traffic is a free app that provides real-time traffic information and traffic forecasts. 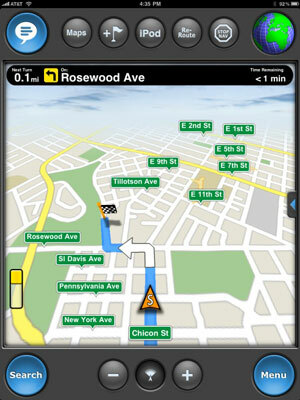 The real-time traffic-flow information it delivers covers major roadways in 126 cities across the U.S. and Canada. Traffic moving at or near the speed limit is displayed in green. Moderate traffic is displayed in orange; heavy traffic is shown in red. Traffic incidents — such as construction, road closures, concerts, conventions, sporting events, and so on — are depicted by icons. When you tap these icons, you’ll see an overlay with details of the incident. Another useful feature is traffic prediction. The app analyzes current traffic conditions, time of day, day of the week, holidays, accidents, construction, conventions, sporting events, and more, and uses the data to predict traffic situations over the next few hours. The maps and onscreen instructions are extremely clear and easy to understand, and they always show the name of the street you’re currently on at the bottom of the screen. The app itself is under 10MB, and it lets you decide how much storage space you want to use for maps. 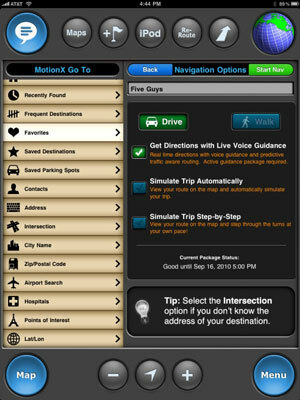 It features “Smart Router” technology that uses multiple traffic-data sources to calculate the best route in real time. It’s easy to use, with all its features available from a single screen. Voice search on Google’s search engine through the Google Mobile App — tap the microphone and speak whatever you want to search for. The app records what you say, sends it to Google’s sever farm for processing, and spits out the results faster than you can say antidisestablishmentarianism (in other words, pretty fast, but not instantaneous). It works very well, as long as you don’t have a lot of ambient noise or a fan blowing at the iPad’s microphone. If you have any interest in knowing about the countries that lie beyond the borders of your own, you’re going to like World Atlas HD. It puts beautiful maps and information about hundreds of countries a tap away — plus, you can put virtual pins on your maps to mark the countries you’ve read up on — or (if you’re a real globetrotter) the places you’ve visited! Maps are accessed through the Internet, but once they’re downloaded, they’re stored on your iPad. You may want to take the time to download all the maps right from the beginning. You have to do them one at a time, but you get faster access the first time you want to actually use them — and you’ll be able to access all the maps offline. The Google Earth app for iPad offers users the same astonishing satellite views of (most of) the planet as the company’s desktop Google Earth map. Covering “half the world’s population” and “a third of the earth’s land mass,” Google Earth for iPad lets you spin a globe to pick a spot, and then drill all the way down to a street-level view of that location.